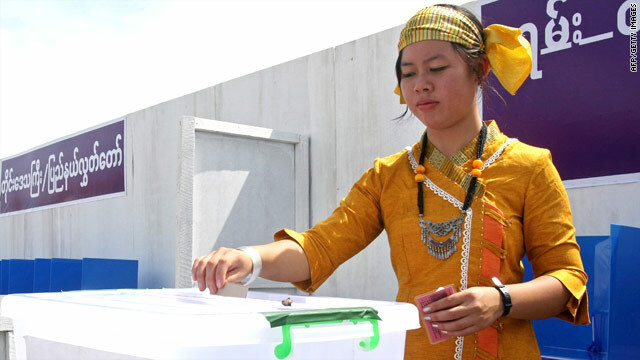 Today, the people of Myanmar for the first time in twenty years will elect a new government. Actually, they will simply participate in a rigged election process that will legitimize the repressive military regime that has controlled the country by force for the past half-century. Under pressure from the West and perhaps craving a bizarro sense of legitimacy, the military is holding elections for the first time in twenty years, yet it has effectively guaranteed that the country will remain under its control. No matter what, the military will maintain 25% of the seats in parliament and will control three key cabinet posts (defense, interior, and border). The two main political parties are offshoots of the military. And the ethnic regions in the east and north will not even be given the chance to vote, as it is “too dangerous” to man polling stations in these regions. No foreign journalists or elections monitors will be allowed in the country and the flow of information has been stifled as the Internet is all but crippled. Not exactly ideal conditions for creating a fair and truly participatory democracy. This is the reality of these types of elections. But this kind of outrageous and brazen election-rigging is not uncommon in countries like Myanmar. Unfortunately, holding elections in countries that are not ready to have them is a core component of our foreign policy. According to the theory, when leaders are voted into office in free and consistently-held elections, they have greater accountability in terms of supporting sensible economic policies that benefit the country. This theory is true…in theory, but not always in practice The belief that elections are a necessary tool for creating economic growth is too simplistic, and lacks an understanding of the institutions that make democracies successful. In order for elections to actually translate into positive policy reforms and economic growth, a country requires a system of checks and balances that prevents the incumbent party from using illegal means to secure its place in government. What is happening in Burma right now is a perfect example of how a country without these necessary checks and balances is basically f-ed. For the residents of 87th Street, a small but densely populated dirt lane in Yangon, campaigning for the elections began with a surprise offer from the municipal authorities: The government would pave their street in exchange for 500 votes for the military-backed Union Solidarity and Development Party. After local residents fed up with mud and dust agreed to fill out the ballots, construction crews arrived and began pouring concrete. But work on the road abruptly stopped when officials realized they had collected only about 100 votes for the party, according to one of the residents. As the elections approach, a narrow ribbon of concrete covers one side of 87th Street. Residents say they hope that construction crews will return someday to pave the other half. Let this be a lesson to all the neoconservative nation-builders out there: an election alone does not a democracy make. The Burmese people are entering election day with a guarded optimism. Unfortunately, things might only get worse.